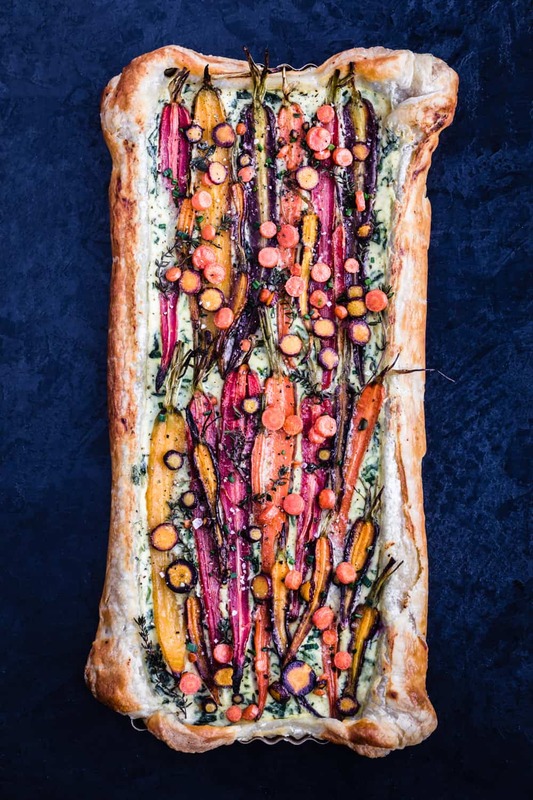 This deliciously festive and very-easy-to-make perfectly puffed savory tart is filled with tangy goat cheese, creamy ricotta, nutrient loaded spinach, a touch of seasoning, fresh herbs, and topped with lots of spice-roasted carrots. This show-stopping tart can be an appetizer, side or entrée, brunch, lunch or dinner, perfect for entertaining, and celebrates food as art! Tarts aren’t just for dessert I say! Using frozen puff pastry allows ya to throw it all together in a flash! Keeping the peel intact on the carrots tastes better and makes for less work in the kitchen. Par-baking the puff pastry ensures that it’s fully cooked and crispy all the way through. The honey on the carrots and in the filling nicely contrasts with the salty cheese, the savory cumin, and crisp buttery pastry. This tart recipe falls in the magic intersection of looks highly impressive and actually super easy to make. The tart can be cut into whatever portion size you like, allowing ya to serve it all to yourself or slice is up and share with others! Savory tarts are about to become one of your favorite dishes for holidays, dinner parties, and game days thinks me! They’re so fun and festive, and I’m gonna show ya just how easy they really are to whip up! For other savory tart inspirations, please check out me Root Veggie Tarte Tatin. 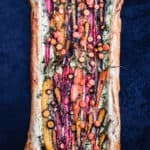 Cut your carrots in half, roast them, roll out your puff pastry, par-bake it, make the filling, whisk all filling ingredients together, pour filling into par-baked crust, topped with the roasted carrots and fresh herbs, bake, slice up remaining carrots (optional), sauté them, use them as an additional topping for the tart with some fresh chives (optional). Marvel at your stunning creation and enjoy! This tart is a like a dose of health on a flaky butter crust… sign me up! This tart is best served fresh & warm. Use that elbow grease and really squeeze that water out of the spinach. The filling will be much easier to whisk together if the goat cheese is room temp. 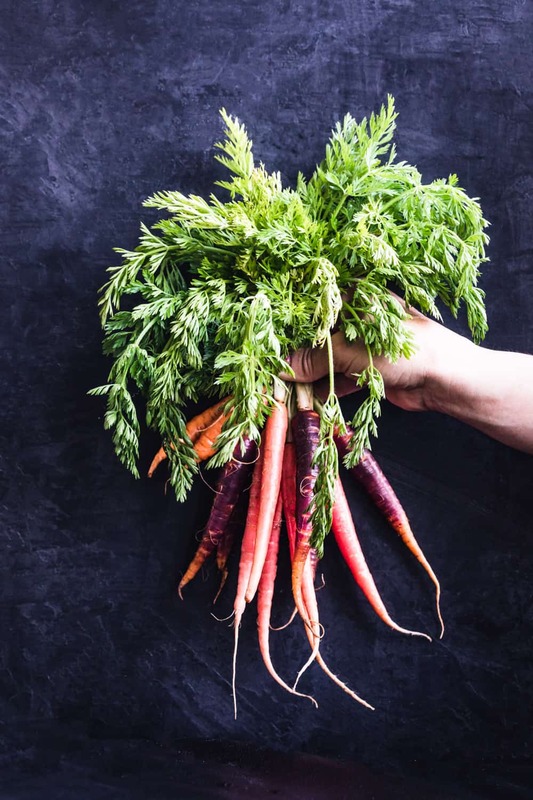 Get creative, have fun, and play around with other root veggie toppings! 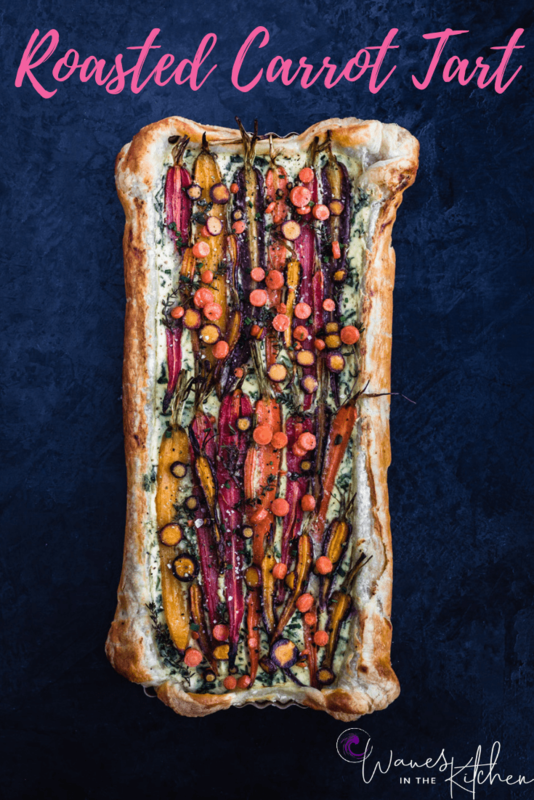 If you’re looking to do some prep work in advance, roast the carrots up to 2 days ahead and whisk the filling ingredients up to 7 hours in advance, then the tart will be a breeze to assemble on the spot! 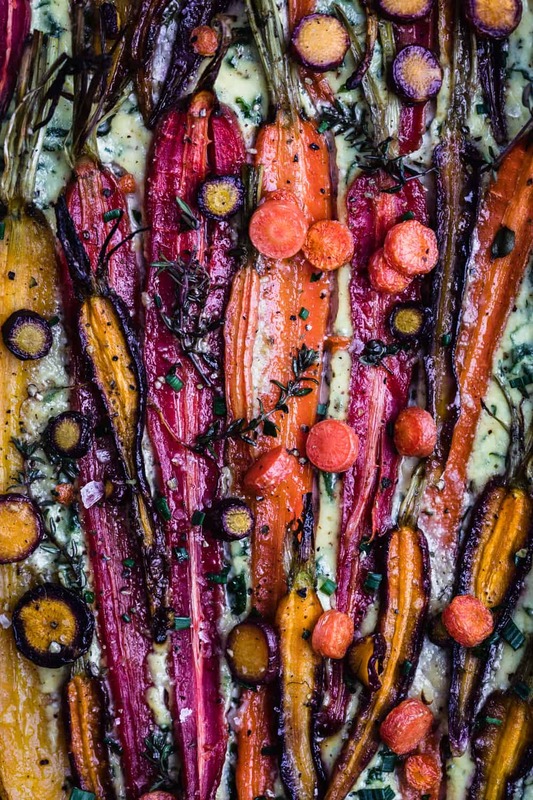 I have wayyyyyy to much fun decorating the carrot toppings on this tart every time I make it and hope you do too. Preheat oven to 375 F. Cut the carrots in half lengthwise, reserving 2 of them (for the topping, this is optional). Whisk 1 tablespoon of olive oil, 1 tablespoon of honey, 1 teaspoon of cumin, salt and pepper together and drizzle over the carrots. Bake for 30-35 minutes, depending on size of carrots, turning halfway through cooking time. On a lightly floured surface, lay the thawed sheet of puff pastry and roll pastry out until its just big enough to fit your tart pan, dusting with enough flour to prevent it from sticking to the counter or rolling pin. Coil the pastry onto the rolling pin to help you transfer it, then uncoil it onto the tart pan. Make an egg wash by combining 1 egg with 1 tablespoon of water. Brush over puff pastry and bake in oven with roasting carrots, at 375 F, for 10 min. Set aside. Meanwhile, bring ½ cup of water to boil in a pot on the stove, place spinach in pot with boiling water, stir and blanch for 30 seconds, until it all looks cooked through. Drain, let cool, and squeeze out excess water with your hands. Chop finely. Combine ricotta, goat cheese, eggs, spinach, and 1 tablespoon of chives, lemon juice and zest in a large bowl. Season with salt and pepper. Spoon ricotta filling into the base and use the back of a spoon or a spatula to smooth the surfaces. Lay roasted carrots over ricotta filling. Sprinkle with thyme sprigs. Bake tart at 475 for 30-35 minutes, until set. Meanwhile, thinly sliced reserved two carrots into disk. Heat 1 tablespoon of olive oil in a pan over medium heat. Cook carrots, stirring, until crisp, 5-7 minutes. Drain on a paper towel. Sprinkle baked tart with cooked carrot disc’s and remaining 1 tablespoon of chives. Enjoy! How much ricotta do you call for? Can’t find with list of ingredients. Updated!!!! Sorry about that and thanks for looking out :)! What a gorgeous tart! I love how vibrant those carrots are. This will be perfect for Easter brunch. Thanks for sharing! Absolute pleasure Amanda! And so stoked to hear you want to make this for Easter brunch! Pretty please let me know how it goes… I’d absolutely love to hear :). The colors in this tart are GORGEOUS. I have the hardest time finding purple carrots around here, but I absolutely love them for stuff like this where the color really shines. Thank you so much Leslie!!! And I hear ya on the purple carrot struggle! Most of the purple on the outside I find are actually yellow or orange on the inside and I’m a big fan of the purple on the out and inside carrots :)! I’ve gotten to know which farms around here grow them… :). Hope ya find purple carrots soon and make this tart too! This is like a work of art! What gorgeous colors! Not to mention it would be completely devoured once made! Hehehe… yes exactly Denise! I’m all about food as art :). And colors! Thanks so much for the super sweet feedback!